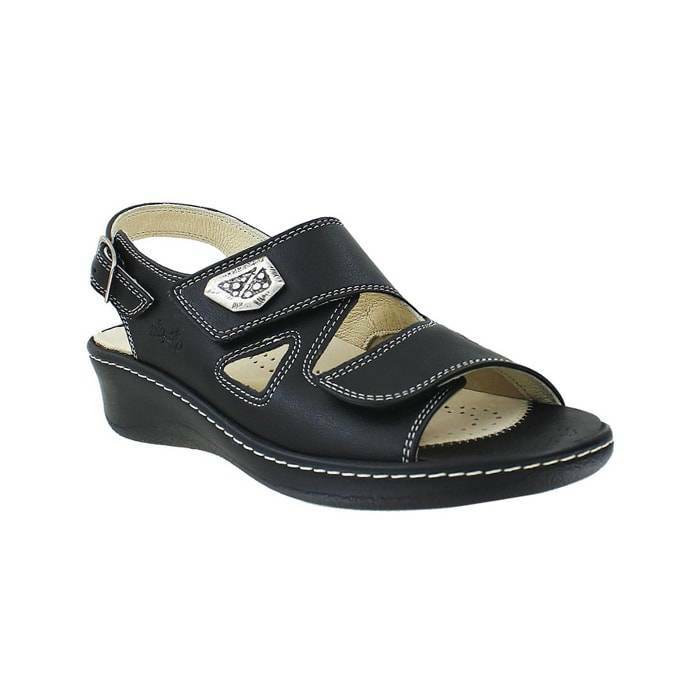 The Fidelio Vienna Black Chevro is a casual women’s leather backstrap sandal with two adjustable hook and loop straps and an ankle buckle strap. If you have a painful bunion you often have trouble finding shoes for your feet. The Fidelio Vienna can help women with bunions. The Vienna has a stretchable insert which is perfectly integrated into the design of the shoe and is invisible. This sporty casual sandal offers women who are suffering from painful bunions a comfortable option. Your bunion stays a secret and the wonderful soft and stretchable insert prevents you from pain. You don’t have to have a bunion to wear and appreciate the Fidelio Vienna Black Chevro. All women can enjoy the exceptional comfort this shoe has to offer. Lightweight, durable and supremely comfortable, the Vienna provides excellent relief and coverage for bunions and sensitive Hallux (big toe) joints. The anatomical cork insole is matched with a deep heel cup for increased stability, while the cushioned strobel outsole delivers traction. Especially designed to meet the needs of people with bunion problems. Slip into a pair of the Viennas and never walk with bunion pain again! Anatomical cork footbed provides stability and absorbs shock. Removable insole can be replaced with orthotics for a custom fit. Air-cushioned midsole with strobel outsole for traction.